A Trane air conditioning system promises to keep your home cool and comfortable all summer long. Swan Plumbing, Heating & Air is proud to service and install this well-known brand in Denver and the surrounding area. Whether you need a repair or want to upgrade to an energy-efficient air conditioning system, our HVAC professionals can recommend the right home comfort solution for your home. 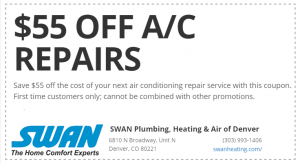 Swan is a trusted leader in providing air conditioning services throughout Denver and the surrounding area. Our outstanding reputation arises from our commitment to providing top-quality products and excellent service. The following are few of the reasons why you should choose Swan for your heating and cooling needs. We always provide a written estimate; no hidden charges or fees. 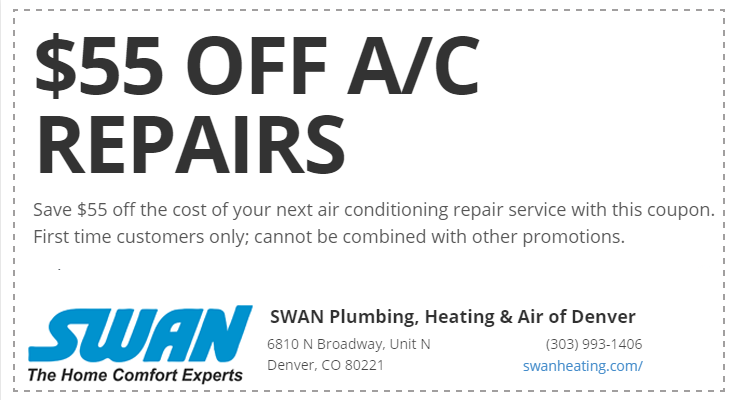 When Denver homeowners call Swan, they know they will get prompt, reliable service from a highly trained HVAC professional. Or, click here to schedule your Trane air conditioning service online. At Swan, we believe in upfront pricing with no surprises. That is why we will always provide you with a written estimate for your repair. Depending on the issue and the age of your AC unit, we can also provide you with an estimate for various replacement options. We warranty the parts and labor on all of our repairs and installations. We repair, service & install all Trane home comfort systems, including the following models. If you have an older Trane AC unit model, don’t worry, chances are we can work with you! The cost of the repair and the age of your AC are two considerations in determining if it makes more sense to repair or replace your air conditioner. If your AC is more than 10 years old and the repair would be expensive, we may recommend installing a new system. Denver homeowners choosing to replace their air conditioning system often purchase Trane equipment because the company backs its products with warranties that are among the best in the industry. If you decide that a new system makes the most financial sense, we will work with you to find the right size unit. Units that are too big or too small for your home’s demands will lead to inefficient cooling and higher utility bills. We will then provide you with estimates for “good,” “better,” and “best” options so that you can choose the right unit for your needs and budget. Frequent repairs, ineffective cooling, and an increase in utility bills are signs that you should consider installing a new Trane air conditioning system. Most homeowners find that they need to upgrade their AC system when the footprint or square footage of their home changes after a remodel or addition. Of course, a Trane system is also a smart choice for your new construction home. Trane manufactures AC units with a variety of SEER, or Seasonal Energy Efficiency Ratio, ratings. This number is similar to the mileage rating of a car. A higher SEER rating means greater efficiency. Good: An AC system rated as “good” typically has the lowest price tag and offers average performance and efficiency. This type of system uses single-stage cooling and is most appropriate for areas that are not heavily used or when the price is a prime consideration. Better: These mid-priced units provide single-stage and two-stage cooling and are the most popular among Denver homeowners. They are able to keep most homes comfortable while reducing energy use and utility costs. Best: These units provide maximum performance and efficiency by offering two-stage and variable-capacity cooling. These systems do come with the highest price tag. Our technicians will work with you to find the right sized system for your home and budget. We will never try to sell you a larger or higher performing system than you actually need. If you are only replacing the air conditioning component of your HVAC system, we can recommend a Trane unit that will work with your existing HVAC components and ducts. Contact us today for more information about Trane AC repair and installation services in Denver and the surrounding area.